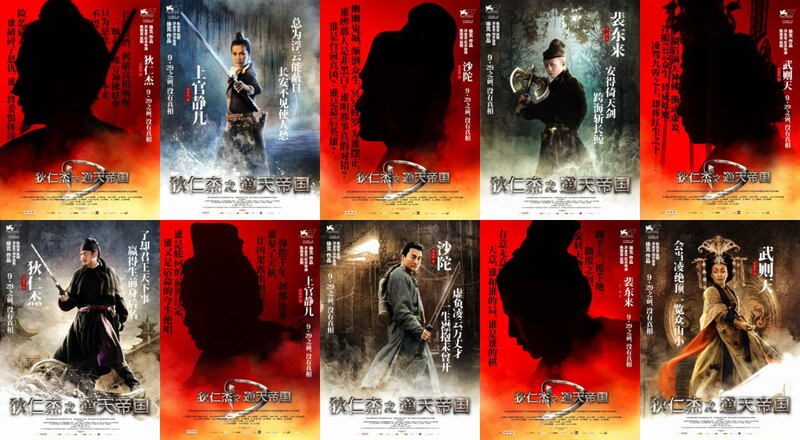 (C)2010 Huayi Brothers Media Corporation Huayi Brothers International Ltd.
まさに国内外で絶賛され、世界を熱狂させてきた「中国版シャーロック・ホームズ」（『 シャーロック・ホームズ　(2009) SHERLOCK HOLMES 』『 シャーロック・ホームズ　シャドウ ゲーム　(2011) SHERLOCK HOLMES: A GAME OF SHADOWS 』）が、ついに日本上陸する!! 7th century Detective Dee is pulled from prison by Empress Wu Zetian to determine what is causing some of her senior loyal officials to evidently spontaneously combust. The film was directed by Tsui Hark, who co-produced the film with his wife Nansun Shi. When asked to direct the film, Tsui said that he would only direct the project if he could make adjustments to the script, which he did. Tsui never divulged most of the changes that he made to the original script, but did mention that the character Shangguan Jing'er was previously a man. Prior to filming Detective Dee, Tsui had spent years doing research on stories concerning real life Tang Dynasty official Di Renjie. Chen Kuofu first approached Tsui with a screenplay based on the life of Di Renjie. For the lead role as Di Renjie, Tsui originally had Tony Leung Ka-fai, along with Tony Leung Chiu-Wai, and Jet Li in mind. Jet Li mentioned while promoting Tsui's other film The Flying Swords of Dragon Gate that he had a chance to read the script though he wasn't able to be part of the project due to some unknown reason. Tsui commented on choosing an actor to play Di Renjie: "Who said that Di Ren Jie must be plump and old? He could also be very handsome. Wits and looks can balance one another." It was announced that Andy Lau would star in the lead role. It was announced that Carina Lau, Li Bingbing, Deng Chao and Tony Leung Ka-Fai would appear in supporting roles. Andy Lau plays Di Renjie, an exiled detective of the Tang Dynasty. To prepare for his role in the film, Lau studied criminal psychology. Andy Lau felt that the character's psychic abilities was one of his greatest traits: "He is a forensic psychologist who knows what you're thinking, from your eyes, your breathing, the pauses in your speech, he could tell what you're withholding, a melancholic detective." Director Tsui Hark on portraying Di Renjie states, "He was someone very special, one possessing nerdiness, good deportment and great foresight. His mentality and philosophies were very different from Sherlock Holmes or James Bond. He can dwell forever in my heart, so I have a very romantic view on him, and must also be immaculate." Carina Lau plays Wu Zetian, the Tang Dynasty empress of China. On her role in the film, she commented on the strength of the empress. "I feel that Wu Ze Tian is a 'superman', her fate is very tragic, but she would find opportunities to defy her fate, to bring her, step by step, closer to her dreams. She has very strong willpower and is very wise, unlike myself." Carina Lau had to practice horse riding for the film, accepting help from a professional trainer: "I have always been rather afraid of horseriding, afraid of such a large animal; but now I have overcome the mental obstacle and the lessons have been rather smooth." Li Bingbing plays Shangguan Jing'er, a highly skilled martial artist, who serves as Wu Zetian's maid and right-hand "man". The character is loosely based on Shangguan Wan'er, who was a poet, writer and politician of the Tang Dynasty. Director Tsui Hark decided to change the character, feeling that a more fictitious character would provide more room for creativity: "There're some things that Wan-er couldn't do, like being a top-notch martial arts expert." Sammo Hung served as an action director for the film and his stunt team built eight platforms (12 meters tall) in the cave for three days of wire work. The record was over 70 wires for one scene. One of the sculptures was a 80 metre bust of Empress Wu Zetian, a key element of the film that cost $12 million HKD to design and decorate. During production, reporters were invited to enter the bust's interior, which included a 12 meter tall circular platform. Outside of the platform hung red and white drapes that were full of scriptures. Detective Dee's martial arts sequences were choreographed by Sammo Hung, who worked extensively alongside actors Andy Lau and Li Bingbing. Tsui choose Hung as a choreographer, feeling that his work had shades of Bruce Lee. Of the fight sequences for the film, Tsui commented that they would be similar to that of Ip Man, as they would aim for realism with actual punches and kicks. This would prove difficult for actors who had no martial arts experience. Of the two actors, Li Bingbing had no experience in martial arts, and her role required that she use various weapons in the film such as a whip and a sword. The character of Judge Dee was made famous in western countries by Robert van Gulik, who wrote 17 new Judge Dee mysteries between 1946 and 1967. The series is now being continued by French author Frederic Lenormand.